Hydrochloric acid based cleaner for exterior use. Removes stubborn stains from brick, concrete, paving and patios, scaffolding and tools. Hydrochloric acid based cleaner for exterior use. Removes stubborn stains, limescale, ingrained dirt, heavy cement and mortar stains from brick, concrete, paving and patios, scaffolding and tools. Apply by brush. Use protective goggles, gloves and clothing to cover face, eyes and skin. For exterior use only. Dilute as stated and test on a small concealed area before proceeding to clean the whole area. 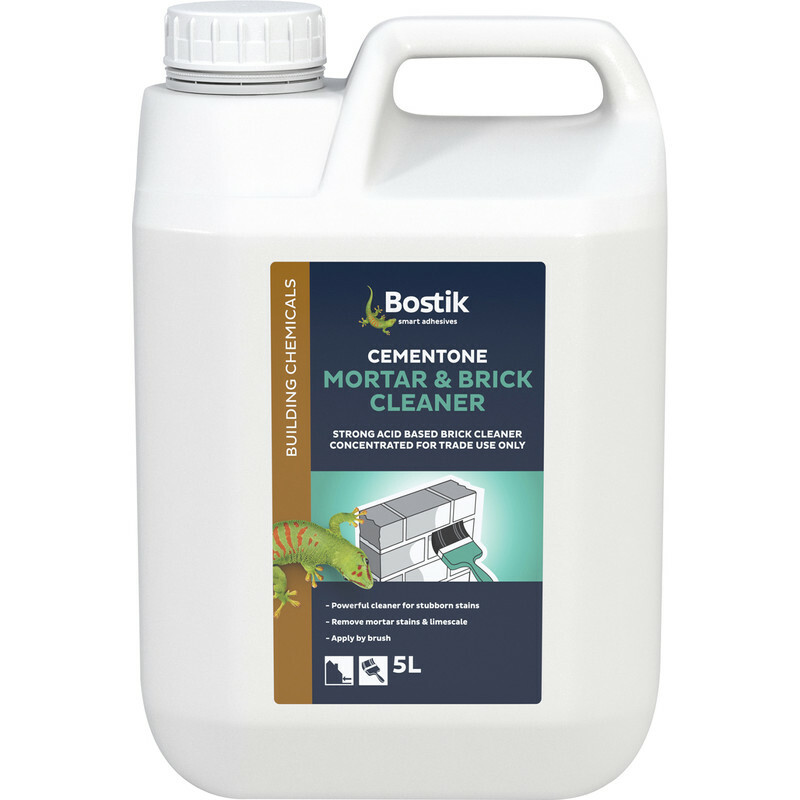 Bostik Cementone Concentrated Mortar & Brick Cleaner 5L is rated 4.8 out of 5 by 6. Rated 4 out of 5 by Kitch78 from Quality product Used this to clean off white salt deposits from brickwork and mortar stains, has done a sterling job although i had to scrub hard to remove them.. and you will need protective gear on as the acid is strong. I would advise using a long handled brush if possible so the acid doesnt flick back on you from the brush. Rated 5 out of 5 by MCstokie from Does exactly what it says on the tub Bought this to clean cement stains from stone wall and worked great especially for the price. Note! This is strong acid so ensure you wear gloves, eye protection and long sleeves. Rated 5 out of 5 by Brens from Outstanding I bought this so I could clean up brickwork after pointing up a section of an old cottage. Someone else gad dobe some BAD pointing sone years before and had left it in a right state. This brick acid not only cleaned up my overspill of mortar but also the mortar that had been stuck on the brick face for twenty years or more. Outstanding stuff. Make sure you use good rubber gloves, mask and goggles. Long sleves are a must also.